The HGR1500 produces drier air when compared against a standard refrigeration type dehumidifier, typically down to 20% RH. This is only possible with a pre-cooling method, in the HGR1500 case, an Air to Air Heat Exchange. 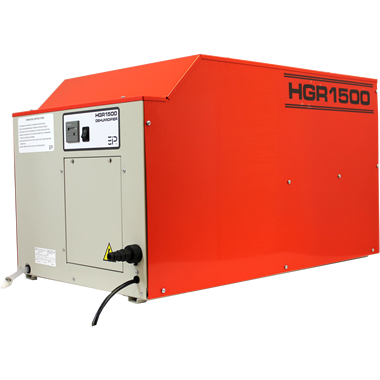 The HGR1500 refrigeration system is fine tuned to ensure the leaving air is at its lowest possible relative humidity, thereby ensuring the maximum drying performance, for the lowest running costs. With over forty years of experience, EIPL is Europe’s leading manufacturer of dehumidifiers and the name you can rely on. No matter how extreme the conditions EIPL’s efficiency copes comfortably even at the coldest temperatures. The HGR1500 is supplied with duct mounting flanges, allowing easy integration into ducted systems. The high lift, integral condensate pump ensures the product is suitable for basement installations, in addition to high level installs, IE attics etc. A washable air filter is Incorporated on the inlet, thereby ensuring the internal coils etc remain unrestricted and therefore always operate at their optimum performance. A plug / socket connection is available for easy connection to a remote humidistat for controlled drying applications. The high efficiency, reverse cycle defrost, is temperature sensitive, therefore ensuring defrost only occurs when required. This unique control maximises the water extraction across all conditions. With 41 years of engineering experience, EIPL always ensures the maximum performance with minimum energy consumption. All components have been carefully selected inorder to maintain the EIPL high build standard, which consequently delivers high quality, reliable products.